Last season, the driving forces behind U SPORTS men’s hockey launched an initiative to educate Ontario Hockey League (OHL) overage players about the benefits of becoming student-athletes through the Canadian Hockey League (CHL) scholarship program. One year later, the effort to drive awareness has grown in scope, stature, significance and popularity. “The CHL scholarship program is easily one of the most flexible and financially rewarding in North America,” Joe Birch, the OHL’s Senior Director of Hockey Development and Special Events, said for a feature produced by Sportsnet. “For every season a player plays in the Canadian Hockey League, he’s entitled to a minimum of tuition, books and compulsory fees. On Feb. 5, at the Toronto Airport Marriott Hotel, overage players from nine OHL clubs – Erie, Barrie, Ottawa, North Bay, Mississauga, Sudbury, Owen Sound, Niagara and Sault Ste. Marie – gathered for a day of presentations that included an opportunity to learn about U SPORTS’ highly regarded hockey programs. Similar events have taken place in Kitchener, Ont. (Jan. 15), Peterborough, Ont. (Jan. 22) and Sarnia, Ont. (Jan. 29), with the final one also in Toronto on Feb. 12. CHL graduates are able to compete for U SPORTS’ 35 men’s hockey programs spread across three conferences and receive their education paid for by utilizing the leagues’ Scholarship Programs, funded by the member clubs of the Western Hockey League (WHL), Quebec Major Junior Hockey (QMJHL) League and OHL. In 2016-17, CHL teams contributed over $6.8 million towards over 945 former players who took advantage of their scholarships, including more than 550 alumni on U SPORTS rosters. A total of 209 OHL Alumni began the 2017-18 season on U SPORTS men’s hockey rosters, giving student-athletes the chance to reach their potential on the ice and in the classroom. 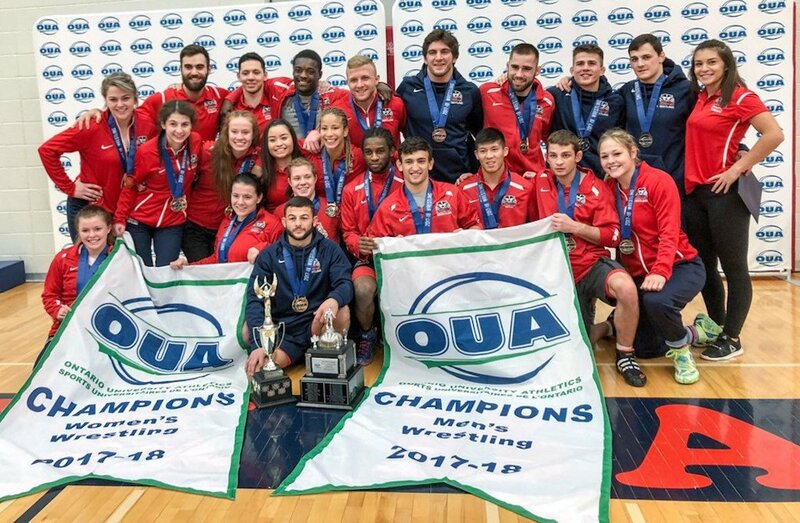 One hundred and fifty-seven players are competing among 18 different Ontario U SPORTS schools, comprising over 25 per cent of the 20-team conference. Leading supplier of talent to @USPORTSca. 209 #OHLAlumni competing across 27 Men's Hockey programs. Elsewhere, 48 OHL grads are playing in the Atlantic University Sport (AUS) conference on six different teams, including 12 members of the St. Francis Xavier X-Men. Four other players are in the Canada West conference with Alberta schools. For Graham Brown, President and Chief Executive Officer of U SPORTS, the presentations are reflective of the organization’s commitment to growing and further strengthening its hockey programs. They are also aimed at bolstering U SPORTS’ reputation as an attractive alternative option for players in the Canadian major junior hockey ranks. “From our perspective, when these kids are going into our programs, we want them to choose the right program,” says Brown, whose son Aidan plays for the OHL’s Barrie Colts. “They aren’t thinking university right now. We want to give them the opportunity to consider a career and education with U SPORTS. “We’re trying to grow university hockey. It’s great hockey and there are plenty of opportunities. We have the series against the Canadian World Junior Team with our best kids and we’re talking with the NHL about the possibility of a senior prospects game (undrafted NCAA seniors versus undrafted U SPORTS seniors). If you find one kid because of that, then we all did our jobs. Brown was joined for one presentation by Ben Fanelli, an assistant coach with the University of Waterloo Warriors men’s hockey team. 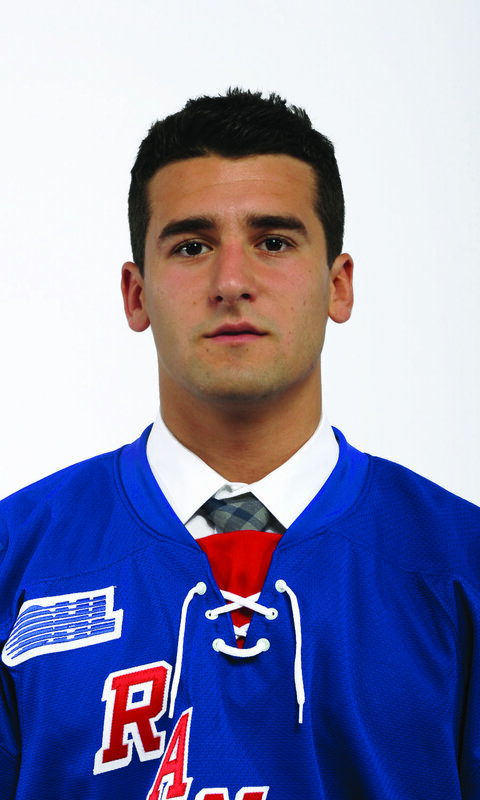 Fanelli played four seasons with the Kitchener Rangers, appearing in 201 regular season games for the OHL club. “You almost have to look 10 years down the road and ask yourself, ‘Is that (hockey) what I want to do full-time for a living?’” offers the 24-year-old, who was named the OHL’s Humanitarian of the Year in 2012, the first Ranger to win the honour. “If you put your eggs into that basket, you’re putting yourself down that path where if you miss the ship to the NHL, it’s going to be something you have to do long-term and you don’t have the 23 best friends necessarily that you have on your team right now in junior. Fanelli sees U SPORTS hockey as a viable path for major junior players to strongly consider. Jeff McKercher, an amateur scout with the St. Louis Blues, also spoke to the junior players on Feb. 5, as part of the career workshop portion of the presentation. A former defenceman with the Saint Mary’s Huskies from 2000-2004, McKercher, today a police officer with York Regional Police, is effusive in his praise of U SPORTS hockey and the student-athlete life. The U SPORTS presentations also highlight CHL alumni who have enjoyed memorable moments – on and off the ice – in Canadian university hockey. Former CHL grads skated off with some serious U SPORTS hockey hardware in 2016-17: University of New Brunswick’s Philippe Maillet (Victoriaville Tigres, 2009-13) won the Senator Joseph A. Sullivan Trophy as Player of the Year; Jordan Murray (Drummondville Voltigeurs, 2013) earned Defenceman of the Year honours, also with UNB; University of Saskatchewan’s Jordon Cooke (Kelowna Rockets, 2010-14) was Goaltender of the Year; Anthony DeLuca (Rimouski Oceanic, 2012-15) of Concordia took home the Clare Drake Award as Rookie of the Year; Calgary’s Elgin Pearce (Medicine Hat Tigers, 2013) won the R.W. Pugh Award (Most Sportsmanlike Player). 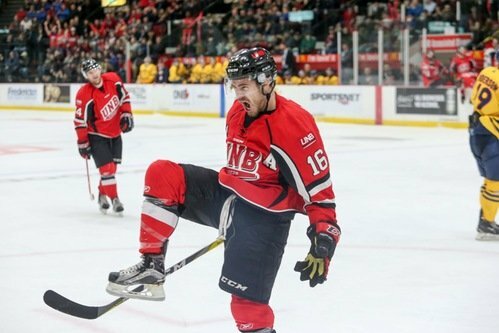 Maillet, also the recipient of the prestigious BLG Award as the U SPORTS Male Athlete of the Year in 2017, was one of 25 CHL graduates who played on last season’s University Cup champion UNB Varsity Reds. He recorded four assists in the championship game against the University of Saskatchewan Huskies as UNB celebrated its second straight title and third in the past five years. The 25-year-old centre is currently playing for the AHL’s Ontario Reign, the top affiliate of the Los Angeles Kings. Murray was invited to the Toronto Maple Leafs development camp in 2016, sitting beside Maple Leafs young gun Auston Matthews in the dressing room. One year earlier, Murray was invited to the Tampa Bay Lightning’s main training camp. A Bachelor of Recreation and Sport Studies student, Murray was named the conference's rookie of the year in 2014 and selected to the U SPORTS All-Rookie team. He has also been a U SPORTS First Team All-Star the last three seasons, while taking Defenceman of the Year honours the past two campaigns. He’s now a member of the AHL’s Belleville Senators, the top minor-league affiliate of the Ottawa Senators. They aren’t the only success stories. Forward Jordan Hickmott, who played five seasons with the Alberta Golen Bears, is currently playing in Austria after skating in the Slovakian league in 2016-17. Defenceman Jordan Rowley, also a Golden Bear alum, is playing in the Finnish Elite League, and centre Francis Beauvillier, who played for UNB and was drafted 174th overall by the Florida Panthers in the 2012 NHL Entry Draft, is in the AHL as a member of the Manitoba Moose, the affiliate of the Winnipeg Jets. Liam Heelis (Acadia, McGill), named U SPORTS Player of the Year in 2014, is currently patrolling centre for Fife of the British Elite Ice Hockey League, averaging over a point per game for the Flyers. The Georgetown, Ont., native played four-plus seasons in the OHL with Peterborough and Owen Sound. Each player, and their story, is a shining example of U SPORTS student-athlete success.